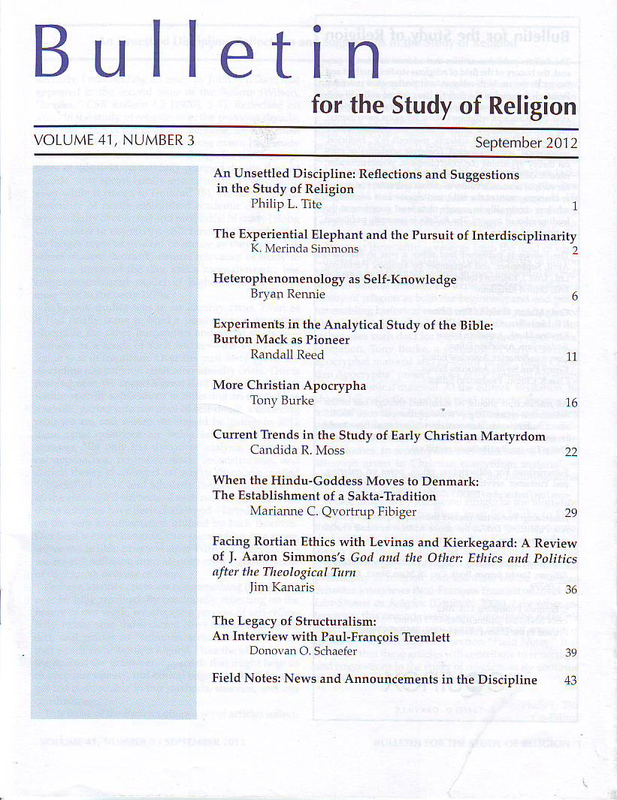 Editor’s Note: In the recent issue of the Bulletin for the Study of Religion, Bryan Rennie published his reflections on a theoretical and pedagogical approach, which he calls “heterophenomenology” (“Heterophenomenology as Self-Knowledge”, pp. 6-11), a new take on the classic phenomenology of religion approach to studying subjective experiences (and the whole eidetic/emic debate). Bryan offers in this blog his thoughts behind that article, specifically as these ideas emerged from and within his classroom teaching experiences. I first undertook to write this article at the behest of two scholars who were attempting to assemble an edited volume on pedagogy in the religious studies classroom (the volume, sadly, seems to have failed and so I sought a venue elsewhere for the article). I had long been aware of the unarticulated and questionable theoretical bases of some (not all) of my own teaching and so I was more than happy to use this opportunity for a little self-investigation. I have my students, early in the introductory course on world religions, read and discuss the 1992 article by Christopher J. Arthur on the phenomenology of religion (“The Phenomenology of Religion and the Art of Story-telling: The Relevance of William Golding’s The Inheritors to Religious Studies,” in Experience of the Sacred). His article focuses on the concept of the “imaginative re-experiencing” of the perspective of the believer as the putative end of such phenomenology, which inescapably raises the specter of the reproduction of subjective experience. I was perfectly aware of, and largely in agreement with, the argument that such subjective experience is necessarily beyond our ken, which renders this an unachievable goal: even if we could “recreate” such experience, we could never under any circumstances know that our “re-creation” was accurate because we could not access the “original” for comparison. Was I so naive and unthinking as to set an unattainable goal for all of my students? I did not believe so. I was also well aware that my final aim was that they should become more conscious of the social construction of their own subjectivity. But, again, given the inaccessible nature of subjective experience, how could I hope that they might attain such consciousness via the pursuit of an acknowledged phantom? I took advantage of writing the article to try to pin down my own inherent and initially unconscious theoretical justifications for such a process and gradually came to focus on the idea of religion as (reciprocally) creation and communication of identity: if religion does operate in this way, then the task of apprehending the perspective of the believer is not some quasi-mystical, “eidetic” vision of a subjective state but the comprehension of a specific communication of identity mediated through religious expression. We do not have to magically divine the subjective experience of the internal states of others, but merely to listen to what they are telling us in their recorded expressions—a much more reasonable undertaking. Since setting down these ideas I have come to realize that the comprehension of communication, while perhaps not mystical and magical, is scarcely less astonishing. Effective communication involves the functioning of dedicated cognitive processes, the specific purpose of which is to apprehend the inner states of the other (folk psychology, theory of mind, the intentional stance, call it what you will), which may, to some extent, rehabilitate even the concept of an “eidetic vision,” at least where the subjectivity of the other is concerned. That said, as far as I took my reasoning in this article, I attempted to establish the claim that we can, to some limited but real and appreciable extent, come to comprehend the self-construction of the identity of the other, and thereby our own construction of ourselves. While I may not have succeeded in adducing an argument that will convince anyone else—such was not my intention in any case—I believe that I have at least articulated my own understanding in a way that I had not previously done. Bryan Rennie is Vira I. Heinz Professor of Religion, Department of Religion, History, Philosophy, and Classics and President, local AAUP, Westminster College, New Wilmington, PA. He holds a PhD in Religious Studies from the University of Edinburgh (1991), and is a specialist in philosophy of religion. His publications include Reconstructing Eliade: Making Sense of Religion (SUNY Press, 1996), (editor) Changing Religious Worlds: The Meaning and End of Mircea Eliade (SUNY Press, 2001), (editor) Mircea Eliade: A Critical Reader (Equinox, 2006), (editor) The International Eliade (SUNY Press, 2007), and (co-editor with P. L. Tite) Religion, Terror and Violence: Religious Studies Perspectives (London: Routledge, 2008). This entry was posted in Pedagogy, Religion and Theory, Theory and Method, Theory in the Real World, Uncategorized and tagged Bryan Rennie, Bulletin for the Study of Religion, Phenomenology of Religion, Religion, religious studies, subjectivity, teaching. Bookmark the permalink.